Some of “It” is scary, some of “It” is hopeful. The scary part is the consolidating evidence of global warming, the surprising acceleration of sea level rise, and the accepting of the profound effects these will have on Rhode Island. The hopeful part is the proactive call to arms by our little state, stepping out in front of the crowd to take meaningful steps to deal with the changes coming our way. Those steps come in the package of CRMC’s Beach SAMP (Special Area Management Plan.) If you don’t know what that is…well…start paying attention. It is time to look over the horizon. Sea level rise is accelerating way beyond previous assumptions. Before anthropogenic warming began accelerating in the mid 1900s, scientists spoke of natural post glacial sea level rise in terms of a few inches per century. 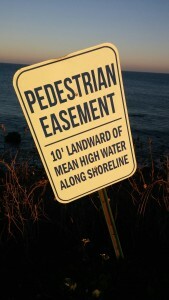 The latest NOAA projections cite the range in sea level rise above 1990 levels to be a maximum of 7 feet by 2100. The youngest of our current schoolchildren will live long enough to see Waterplace Park, Galilee, Misquamicut and much of Wickford and lower Newport under water, and whole waterfront neighborhoods abandoned. Now several years in progress, the SAMP process has been a national leader in preparing to deal with coming realities. Our state university, world renowned in oceanography and earth science, has been a blessing. They have been gathering data, holding public discussions, and putting together useful proposals to help shore towns and cities think, and more importantly act, to minimize the cost and disruption of the coming changes. A good example of an early proactive measure is the “armoring” of the sewerage treatment facility in Narragansett near Scarborough State beach. The proposed earthen berm (i.e. an artificial ridge or embankment) and wall will be needed to protect that critical infrastructure item from damage in the future as the sea rises. But there is something else that needs protection as the coastal future becomes the coastal now, and Save the Bay has taken a step to make sure that it is included in the SAMP process. Save the Bay, and CRMC, are also protecting the people of Rhode Island in another important way. They are protecting our very precious and unique right to use the shore. 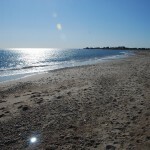 Among other rights of the shore, we have the right to “pass along the shore.” STB has entered an opinion regarding the Narragansett sewer project, saying that without including a way to walk, fish, or collect seashells along the shore in front of the sewerage plant, the engineering for the project is not complete and it should not go forward yet. They have proposed moving the protection structure forty feet landward to allow passage in front of it. That would be a good thing. I would add an alternative proposal if another is needed. Namely, if the barrier truly can’t be moved inland, put a walkway along the top of the structure to allow passage across the treatment property to the beach on the other side. That would be a good thing also. Most certainly creative, outside the box solutions will have to be part of the remedy for this never before experience of dealing with such rapidly accelerating climate change. 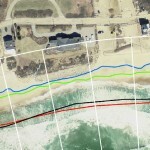 Of course the sewer plant project in Narragansett is just one pixel in a much larger picture. As another example I have included a pair of pictures from the SAMP data available on the CRMC website titled Shoreline Change Maps. 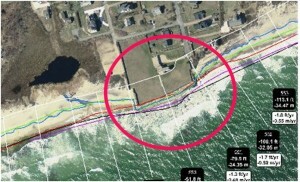 One shows a satellite view of a house and a hotel in Misquamicutt Beach along Atlantic Avenue with the movement of the land/water boundary, identified by colored lines, over the last 77 years. You can see that both locations have constructed boulder walls across their property. One lesson comes from the boxes at the end of the survey lines going out into the water. The black box shows the total movement landward of the land/water boundary since 1939. At line #169 it has moved 109 feet, which means that 109 feet of that real estate has disappeared! The learning comes with realizing that although the sea has risen only a number of inches over this time, the land/water boundary location moves many feet landward because the land, in most places, is a gentle slope rising away from the water. The white boxes show the same survey data in another way. They show the average number of feet per year the shore has moved inland. At the location of line #169 it has been retreating at an average rate of 1.5 feet per year…every year, and that rate is accelerating! The colored lines highlight the second lesson we can gleam from this CRMC image. The red line is 1939, the black is 1951, the purple is1963, the green is 2012, and the blue is 2014. Notice that through 1951 the shoreline was far enough in front of the house and hotel that there was room for anyone to pass along the beach without problems. By 2012 the sea had risen up the land to the point that there was no longer anywhere to walk in an effort to pass along the beach. By 2014 a person would have to hazard rock climbing the wall to get by along the shore. Bear in mind that people don’t come to Misquamicutt for the restaurants and hotels and happen to use the beach. The restaurants and hotels only exist there because of the fabulous, unobstructed, world class strand of sand on which they can recreate. 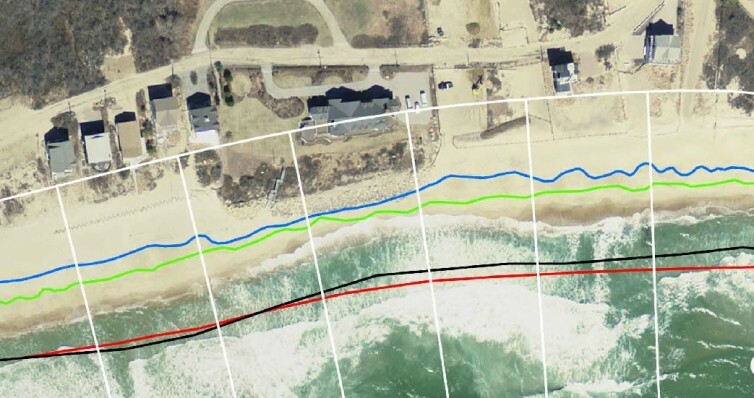 Every year the town of Westerly takes in millions of dollars because of the miles long beach that people can enjoy and “pass along.” Protecting lateral access along the shore is as much a local economic business issue as it is an emotional civil rights one. People have walked along this beach as far back as memory of it goes. The blue line is from 2014 surveying. Even then people would have had to climb over the foot of the rock wall to pass by. At the present time (2016), at high tide or after a big storm, the only safe place to walk is along the top of the rock pile wall across the house’s yard. It will be a challenge going forward for shorefront properties to find ways to accommodate citizens passing along the shore as the sea advances up and over the land. The important take away is that the shoreline location maybe changing, but our constitutional privileges of the shore are not. There are many, many more locations in Rhode Island with the same dynamic unfolding. I have one last “happening” to report. 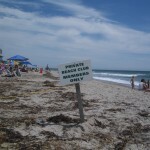 Check out the photo from the Rose Nulman Park at Point Judith in Narragansett. The signs posted all along the shore read, “Pedestrian Easement 10 ft landward of mean high water along shoreline.” The erroneous idea that our shore privileges only exist below the high tide line is being rejected. The fact is that the shore along which we have the right to pass (as well as conduct other activities) is a narrow strip of land bordering the sea…dry land. 2. Participate in local and regional discussions about the process and the local choices and decisions to come. 3. Remain steadfast and vigilant in your efforts to preserve the priceless inheritance of our citizens’ rights to use the shore…for us today and for generations of Rhode Islanders to come. [www.rishoreaccess.org]. See you at the shore.